I feel naked without jewelry. Even if I'm in sweats at the grocery store, my writs and fingers need something shiny and colorful or I'll hide my hands in my sleeves. Luckily I have enough jewelry where there's so many options I rarely forget to leave the house without matchy-matchy jewelry. I have so much of it (just look at my necklace collection), that there is no way I could stay organized without at least one jewelry box. This little thrifted one is for my collection of handmade bracelets and anklets as well as my pair of barefoot sandals. It's kept in my bathroom / closet since it's the most logical place to see it when I'm getting ready for the day or else I'll end up at work with naked hands and wrists feeling self-conscious. Seeing this little wooden box at a thrift store sparked some crafting potential in me as thrifting always does. The flat and wide drawers were the perfect canvas for something pretty, but I wasn't sure what. Until I discover the painting skill from my father that I never knew I had, I thought I'd at least start by giving the drawers a new life. 1. 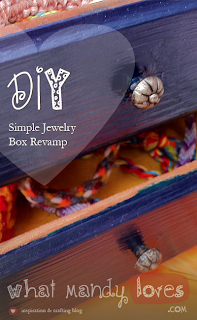 If your jewelry box is wooden, you have the option to sand down the sections you wish to paint with sand paper. This will remove the original slick surface and help the paint stay longer, but it's completely optional. I did not sand mine, so use your better judgement. 3. Paint the desired areas in as many coats as you see fit. I gave each coat an hour to drive before starting another and finished at four total, leaving it to dry overnight. 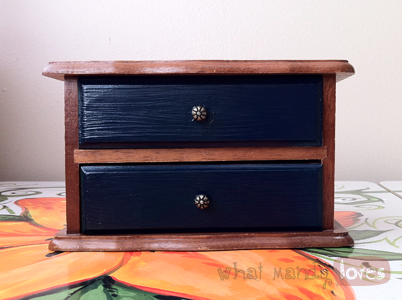 I could have sanded the drawers a little and do my first coat in white to make the dark blue coats stand out more, but I wanted it to look a little more stained to match the original wood. 4. The next morning, I layered on a thin coat of Modpodge to give it a little shine and strength. Let this dry for at least an hour before slowly removing the tape. Ta-da! My little jewelry box looks so much better than it did before. 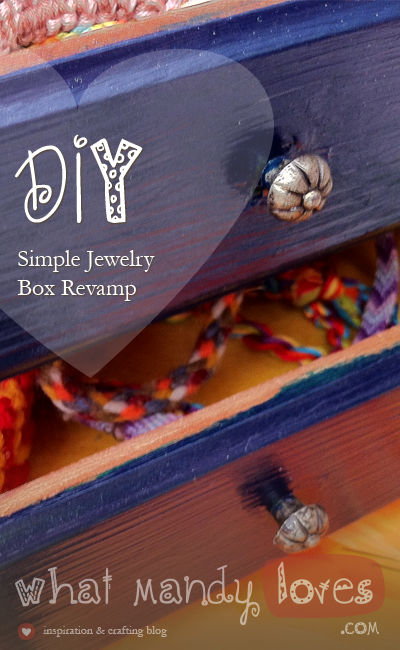 Do you have a jewelry box or display that needs a bit of love? What did you do to spruce it up? Let me know in the comments!